When John Withey joined the FIU family, he did so with more than just a love for research. He also brought with him a passion for mentoring and educational outreach. An urban ecologist, Withey’s research focuses on the responses of birds and other terrestrial vertebrates to anthropogenic changes, including population dynamics, predator-prey interactions and habitat selection of birds in an urban environment. A West Coast native, Withey was born in California and raised in Seattle. He credits his family’s interest in backpacking with instilling in him an appreciation for nature and the outdoors that still lives within him today. Withey earned a bachelor’s degree in biology from Pomona College in California in 1991. After graduating, he landed a job as a wildlife biologist with the U.S. Bureau of Land Management in Oregon investigating the habitats of spotted owls in Oregon. He also worked with the U.S. Forest Service in New Mexico studying the Mexican spotted owl. In 1994, Withey enrolled in the U.S. Peace Corps and headed to Panama. As an environmental education trainer, he developed and led environmental education training workshops for teachers and created curriculum for K-6 schools. After returning to the U.S. in 1996, Withey decided to pursue graduate study at the University of Washington. He returned to Panama in 1997 as an avian research assistant with the Smithsonian Tropical Research Institute. Withey earned a master’s degree in wildlife sciences in 2002 and a Ph.D. in forest resources in 2006 from the University of Washington. Afterward, he served in a variety of roles, including as an instructor and as a postdoctoral research associate at the university and at the Smithsonian institute. 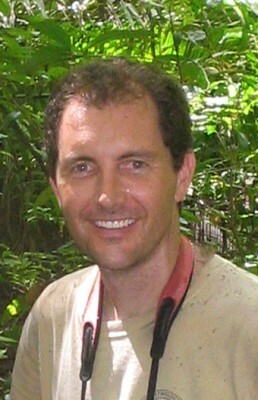 Withey joined FIU’s Department of Biological Sciences in 2012 as an assistant professor. He teaches undergraduate courses in ecology and vertebrate zoology and is currently developing an urban ecology course. Withey’s current project, Bird diversity and habitat relationships in a subtropical urban area, will build a network of sites across South Florida, including the FIU Nature Preserve, Tree Island Park and Preserve and Ron Ehmann Park. It will test how certain bird species respond to their hardwood hammock habitat, isolation and surrounding land use. The research will also look at how non-native species interact with, and possibly limit, these native birds. Withey’s project will also involve students across different levels, including high school students involved in the Fairchild Challenge’s “Schoolyard Birdwatch” program, undergraduate students taking ecology courses and graduate students interested in avian ecology.